MarPaso Solutions leverage Agile Project Management approaches necessary in today’s fast moving, cost conscious and hardware agnostic Cloud environment. Our Flagship Methodology in Change Management is repeatable and accommodates uniquenesses in highly regulated industries. Let’s face it, projects fail because of user revolt, fractionalized leadership, individual apathy, project fatigue in middle management, and shifting influences. Our Organizational Transformation approach is proven, and accommodates the reality of an operational environment attempting to change while embracing a new organization, changed processes and an enhanced technology platform – yet we still need to get along and accomplish the mission effectively. Organizational Change that MarPaso methodologies can be impact may be critical to the success of Mergers & Acquisitions, facility moves or construction, re-org, compliance initiatives, lowering turnover, or making necessary changes to accommodate today’s changing workforce. We can help, click here to contact us now. 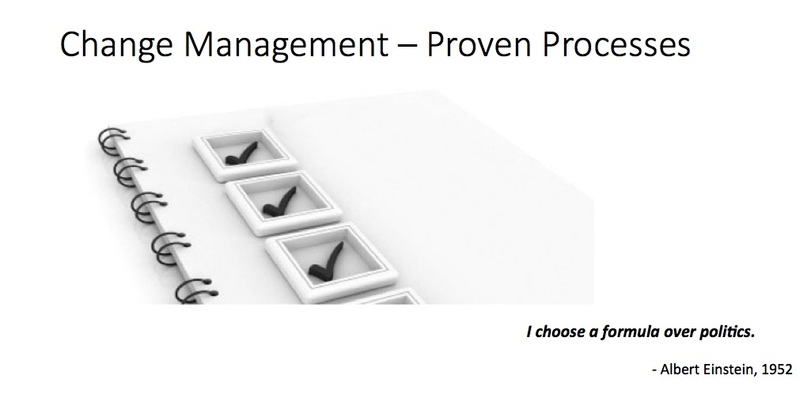 Change Management should have full integration with the Enterprise Project Management Methodology at the client site. We have implemented ERP and have enterprise implementation methodology certifications, and managed Agile projects. Project Governance is key. Effective identification and involvement of the true influencers and Key Stakeholders in each department are critical. A communication plan supported across the organization is utilized often. Support, as indicated by action, from top to bottom of the organization is also a harbinger for success. Transition from training to skills transfer is a meaningful step for Transformation. The focus is on getting the project completed with a reduction in time to value, quality data, and meaningful skills transfer at the individual information worker level to enable the transformation that proves the project’s value. Compliance and Beyond. Our leadership brings 30 years of project depth to our clients, helping projects stay on track, on time and under budget. Successful projects accommodate unique mission critical processes that you have made even better than best practices. Proven Methodologies MarPaso utilizes practices, processes and approaches proven to yield results, while enabling the clear and necessary Communication Plan. We help ensure the project priorities are in focus, decision making is well thought out and documented. 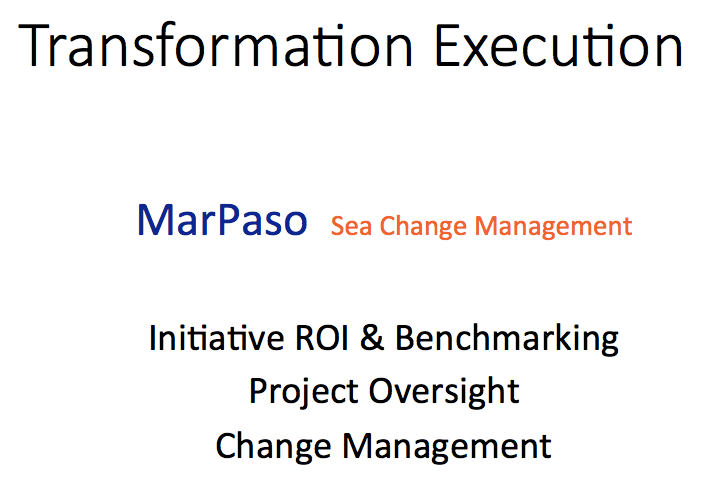 MarPaso Change Management calls for and can measure the required skills transfer so organizational transformation may take place efficiently and smoothly. Strategic Initiatives Our offerings above are based on repeatable and proven models that have stood the test of time by working in companies like GE, PeopleSoft, Oracle, SAP, MSA, Kronos, and with great partners including Guidehouse, PwC, Accenture, Deloitte, and others. Leadership has a depth of experience in Public Sector, Healthcare, Oil and Gas, Energy, Education, Manufacturing and Service industries. We have trained thousands of professionals, sold hundreds of millions, impacted market caps in the billions, taken companies public on Wall Street, formed them from scratch, been responsible for M&A from both sides, and enabled reorgs with significant results. 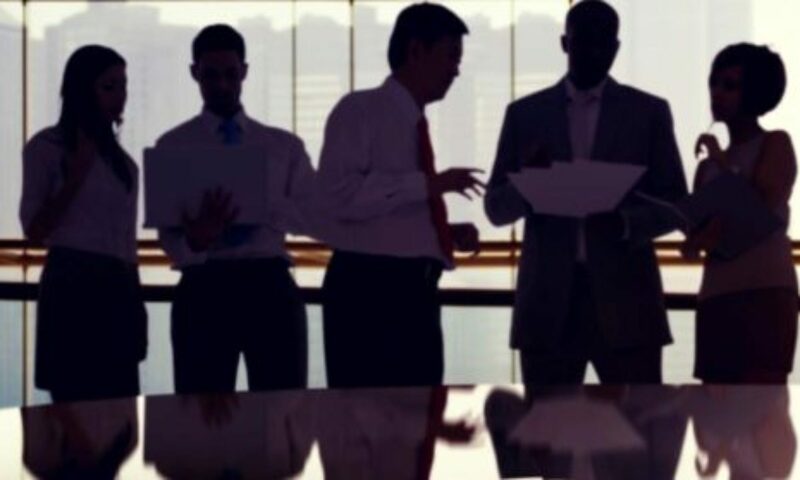 We use proven approaches in Leadership, Goal Setting, Product Planning and Competitive Assessment, Hiring Models, Compensation, Recruiting and Training, Company Formation, Public Policy and Capital Raising. Project execution or strategy, MarPaso is qualified and ready to help today.